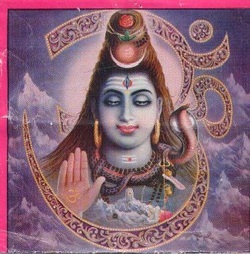 My Patron god is Shiva, god of destruction and renewal. Shiva is a famous god of the Hindu religion, and like Hekate, he has a triple form as well, as Knowledge, Fortitude and Courage. Also like Hekate, there is a misconception of him as the destroyer. What he destroys are the evils or the 'demons' of the world, the sins and the corruption in order for the world to be rejuvenated, much like a newborn baby. He is considered one of the wiser gods and is closely related to both the Crown and Third Eye Chakras, as you can see in this image, his Third Eye is open. He is enlightened as you can tell by the relaxation of his eyelids, another atonement for his enlightened aspect. This sitting pose is one of his many forms, it is his stand still, his enlightened form. Another form of his is the dancer, in which he destroys the old world to create a new one. Each of those symbols that surround all have different meanings, take for example, his trident. The three prongs of his trident represents the three powers of knowledge, desire and implementation. His drum symbolizes sound, which represents the Vedas or holy scriptures. The snakes represent the ego, which when mastered, can be worn almost like an ornament. The beads that he wears are Rudrashka beads which symbolize concentration. The crescent moon that he is almost always depicted as wearing symbolizes that he as a deity is timeless and that because of this, he can control time. Finally the tigerskin that he wears is to show that he is a fearless god. Shiva is also new to me as well, recently showing up after Hekate arrived. To me, he is very fatherly and protective. Standing behind me as a giant, trident in hand.